“This post was sponsored by NEW! Tide purclean as part of an Influencer Activation for Influence Central. While I have to admit I’m not the most environmentally conscious person, I do try my best to reduce my carbon footprint whenever I can and, most importantly, when I can ensure the same quality and efficiency I’m used to in a product. That second part is key for me! My family goes through a lot of laundry every week and my kids are basically stain magnets. We’ve trusted and relied on Tide detergent for many years and that’s why I was so happy to learn about its newest product which is an eco-friendly version of the brand we know and love. Tide purclean is the first bio-based detergent with the trusted and reliable cleaning power and performance of Tide*(*65%bio-based). The Tide purclean formula is made with 100% renewable electricity and is made at a zero manufacturing waste to landfill site. It’s also certified by the USDA BioPreferred Program. There are several different reasons a lot of people prefer eco-friendly laundry detergents. First of all, when you think about how many gallons of water used on a daily basis for laundry – and not just in my house – you can imagine the long term effects chemicals from other detergents can eventually have on the environment. I know first hand how hard it can be to think that far ahead, but pretty soon, we may have no choice. Like I mentioned, one of the most important things I look for when deciding on whether or not to opt for the more eco-friendly option is in fact, how well the product performs. 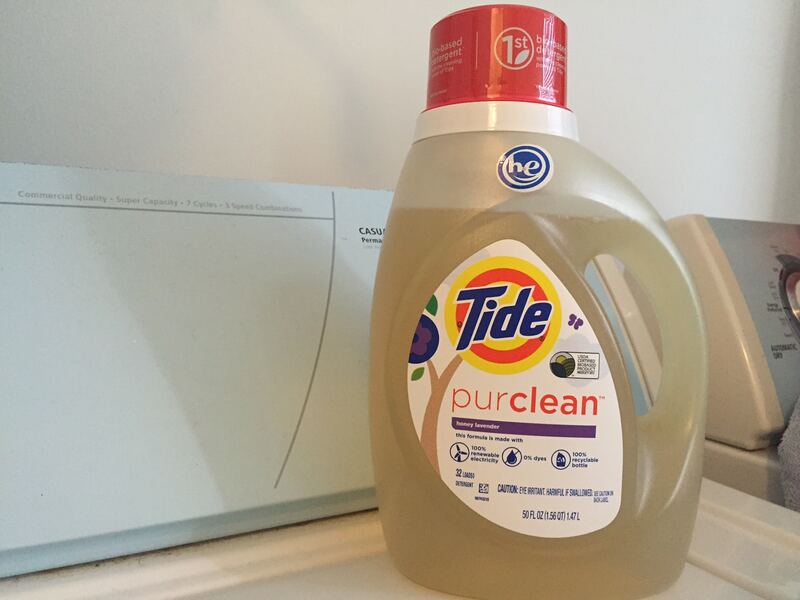 Tide purclean truly gives you the same great product performance as the original Tide. My clothes came out nice and bright, with the sweet scent of honey lavender. Plus, since Tide purclean is designed free of dyes, chlorine, phosphates or optical brighteners, I feel great about using it on the kids’ laundry each week. It’s pretty good with stain removal too, which is a major benefit when it comes to their laundry loads. The NEW! 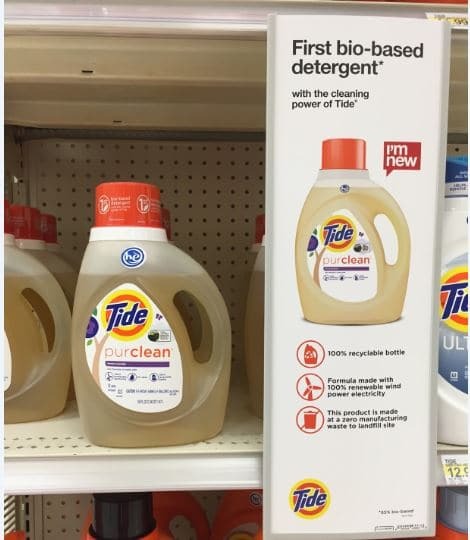 Tide purclean™ is available right at your local Target in the laundry detergent aisle. It retails for about $17.99 for 75 oz of detergent, aka 45 loads. 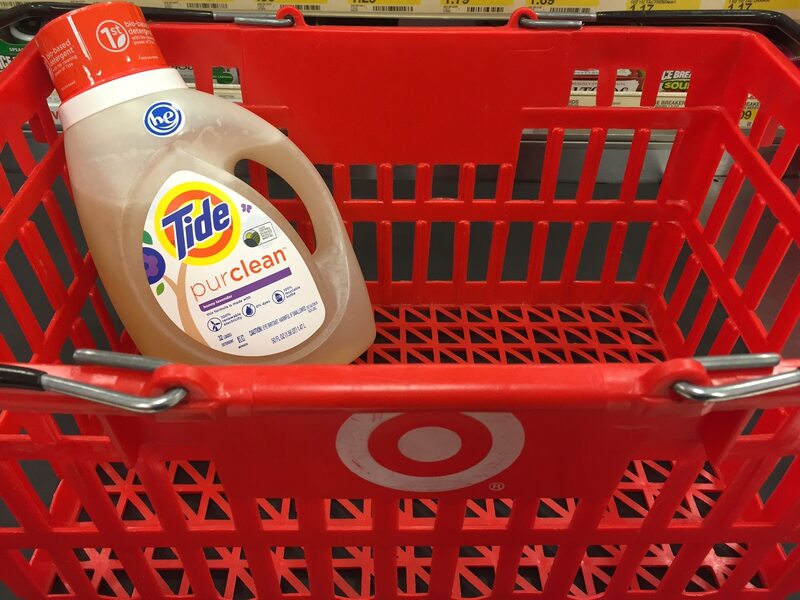 Plus, now through July 30th, you can get some pretty good savings on the New Tide purclean with this $1.00 off coupon, plus save an additional 10% savings through the Target Cartwheel mobile app. **Don’t forget to check out these 13 Eco Friendly Products You Need In Your Home! I’ve been seeing this a lot lately and I can’t help but get it the next time I go shopping for a detergent. I love that it’s not made with chemicals so it’s perfect for sensitive skin and it’s eco-friendly as well! Tide products are amazing! I really love all of them. I love tide. Love it even more now that it’s echo friendly and made with renewable energy. What an amazing product. I love that they are creating more eco-friendly products. I’m going to look for it the next time I’m shopping. In our household, we also trust Tide. They have already set the standards and ita hard to look for alternates that wouls give the same cleaning power as Tide’s. Looks like a good and effective cleaning solution, will have it tried out. I haven’t seen this one. I’ll definitely try it. I love Tide. I have recently seen this in the store. I love that companies are now trying to be more eco friendly. I will have to check this out. Oh this sounds good!! I have seen it a few times but since I have detergent at home I haven’t bought it yet. I really want to give it a try mainly because it doesn’t have harsh chemicals and its eco-friendly. We don’t have this in our stores 🙁 Sounds good tho 🙂 As soon as we have this, I’m so gonna try this.